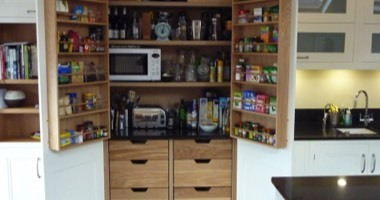 The larders we make can have any configuration which includes internal dovetailed oak drawers, bottle/spice racks and shelving. You can also have a section of worktop above any drawers to create a little workstation for small appliances with sockets set in the back of the cupboard.It is an ideal place to put a small microwave. There are many options you can have including internal lighting.